Developed with the support of LCBO, this handout for future parents is printer-friendly and in plain language. 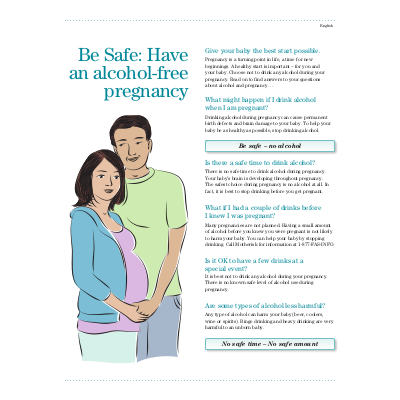 It provides information for expectant parents about the risks associated with alcohol use in pregnancy and about FASD, as well as tips to reduce one’s alcohol consumption, and places to get help. Also available in French, Arabic, Chinese, Cree, Hindi, Ojibway, Punjabi, Spanish, Tagalog, Tamil, and Urdu.